A kindler, gentler Mike Tyson? 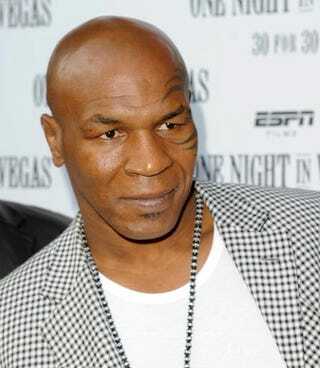 Mark Cina of the Hollywood Reporter is reporting that the animal-rights organization People for the Ethical Treatment of Animals is stepping into the ring with boxing legend Mike Tyson over his new reality show on Animal Planet. The animal-rights group is going after the famed boxer for his new project, Taking on Tyson, which documents his entry into competitive pigeon racing. "If Mike Tyson truly loved birds, he would fight for their protection — not force them into a 'race' that tears them away from their families and subjects them to injuries, exhaustion and death," said PETA Vice President Lisa Lange. The show, which has received mixed reviews, is an attempt by Tyson to introduce a different side of himself to fans. PETA is arguing that this side is no less brutal than the other side. PETA, with its racy ads that objectify women and men, continues its quest for publicity. How it is not able to see the link between the objectification of women's bodies — which it promotes constantly in its advertising — and violence against women is befuddling. Yet and still, it wants us to be up in arms over animal rights. We don't disagree with PETA's "mission," which should be amended to include publicity seekers, but we do take issue with some of its tactics. As for the show, this isn't necessarily a family sport, as the NFL pretends that football is, in the case of Michael Vick. It's Tyson being Tyson and letting folks in for a peek at what brings him peace. Unfortunately for him, that ruffles PETA's feathers. In other news: Kwame Kilpatrick Testifies in Slain-Stripper Lawsuit.